So last night was Friday night rosary. We had a rather small crowd for us, only four familes. 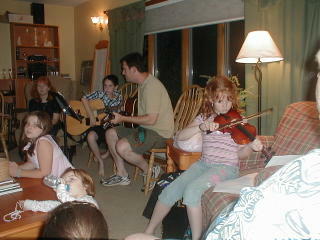 My son Ryan and our friend Dan accompany on the guitar and the violinist is an accomplished young girl named Sara. We meet every Friday at a different house and have pizza and then pray the rosary together. After each decade Dan chooses a song appropriate to the decade. The group has been in exisitence 11 years and we have been participating for 6. The fruits of the this prayer group are unbelievable. Before prayers the kids had fun in the pool or playing a cool computer game that actually had a camera and hooked up to the tv somehow. The kids were able to see themselves in the game. Don’t ask me I have no idea how it works. Pretty neat.